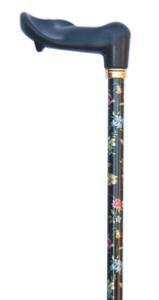 An elegant patterned cane with a supportive orthopaedic handle, ideal for sufferers of rheumatism, arthritis and other hand complaints. The shaped black plastic handle spreads the user's weight across the palm of the right hand and is easier to grip than a standard walking stick handle. The aluminium shaft features blue, red and yellow flowers with green leaves on a black background and co-ordinates well with almost every outfit due to the range of shades in the pattern. The height can be adjusted between 75 and 99cm (approximately 29.5"-39") so it can be used by people of a wide range of heights. It is fitted with a non-slip black rubber ferrule and a smart gilt collar. Also available in a left handed version to make a pair.